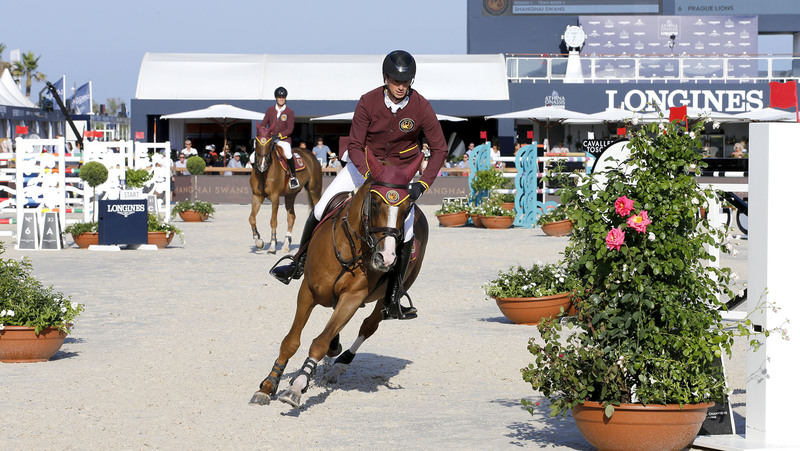 Shanghai Swans’ Daniel Deusser and Pedro Veniss soared to a second pole position of the season after a challenging GCL first round tested the world’s best on the French Riviera. Just a short stroll from the turquoise waters of the famous Pampelonne Beach, the show is nestled in the heart of the Cote D’Azur. The event, making its debut on the Longines Athina Onassis Horse Show this year, brought out the red carpet as VIPs and beautifully dressed guests flocked to the sixth event of the Championship. Spectators were treated to a showcase of the world’s best athletes in action, as teams fought for the coveted pole position ahead of Saturday’s showdown. But only two teams could manage the elusive double clear, with Shanghai Swans leading the charge ahead of Miami Celtics who put in the only other clean score of the day with Shane Breen and Jessica Springsteen. Slipping into third were the Monaco Aces, with teammates Simon Delestre and Jerome Guery fastest of the four faults in a tight fight for supremacy. Uliano Vezzani’s course took no prisoners, with a colourful triple combination set along the grandstand and away from home, a gappy Premiumares fence, delicate Dolce and Gabbana vertical as well as an imposing Julius Bär oxer to finish. A consistent rhythm and attacking pace looked to be the order of the day, with precision turns making all the difference in the long sand arena. From the start, the world’s best were tested as the fences came up thick and fast, with the pathfinding Berlin Eagles’ Ludger Beerbaum and Ben Asselin rolling a pole each. Bertram Allen and Gin Chin van het Lindenhof of Valkenswaard United collected an uncharacteristic 12 faults, but teammate Alberto Zorzi and Fair Light van T Heike pulled out a brilliant clear, showing just why the Italian rider has become such an important anchor for the blue and orange team. Simon Delestre of Monaco Aces, fresh from his CSI5* McLaren Prix win earlier today, came up trumps with Hermes Ryan, riding clear as the pair blazed around the arena quickest so far. Just one pole down for teammate Jerome Guery and Garfield de Tiji des Templiers put them into the lead on four faults overall, with the rest of the world-class field to come. 2017 Champions Montreal Diamonds brought out World Number 1 Harrie Smolders with Emerald and U25 rider Jos Verlooy with Igor - the 9 year old son of Emerald. Seasoned campaigners Smolders and Emerald had an unusual two poles down, including the last, as the gleaming chestnut bucked and skipped his way around the arena. Verlooy was also caught out by the triple combination, putting the team on an overall score of 12 and right in the middle of the pack ahead of Saturday’s final. A carefully managed clear from Olivier Philippaerts and H&M Legend of Love put overall ranking leaders London Knights in a strong position, however teammate Ben Maher and Winningood clipped the oxer in middle of the triple combination to collect four faults - putting them on an equal score as the Aces but on a slightly slower combined time. It would be a long wait for the first double clear, but finally the penultimate team, Shanghai Swans, put in a foot-perfect round with Pedro Veniss with Uccello de Will and Daniel Deusser with Tobago Z - the duo teaming up for the second time this season. Indeed, it was the very same pair who took pole position at GCL Madrid, with the combination a proven team for the crucial first round. The final team to go, Miami Celtics, were the only contenders who could steal the coverted pole position from the Swans. Shane Breen set off with clear determination, mastering a brilliant clear with Ipswich van de Wolfsakker to put the pressure on teammate Jessica Springsteen to follow suit. Setting off at a fast but careful pace, Springsteen rode RMF Swinny du Parc beautifully around the sand arena, as Breen watched on with baited breath. Clear to the last, Springsteen galloped through the finish gates but stopped the clock just shy of the Swans’ combined time, slipping the Celtics into second. So it would be the Swans who take their second pole position of the season, with team managers now discussing strategy and tactics, and which pairing to play up front on Saturday 2nd June. The action kicks off at 14:25 local time, with the class streamed live via GC TV and on the official GCL Facebook page.